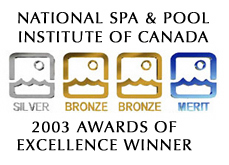 National Spa & Pool institute of Canada - the swimming pool industry's premier publication - ranks top builders in the industry. Having recieved these awards, our company would like to thank all the customers that have helped us over the years in so many ways, as without them, we would certainly be nowhere. Rintoul's continues to improve workmanship through training and technology improvements. It has been 10 years since competing so we are looking forward to the 2014 Awards OF Excellence competion in Canada. So thanks again everyone for your support .